“The Wharf, The $2.5 billion, 3.2 million square foot world-class, waterfront neighborhood built by development partnership Hoffman-Madison Waterfront (HMW), is celebrating the holiday season with festive moments for friends and families to enjoy from watching a parade of illuminated boats and fireworks by the edge of the water, making s’mores at The Wharf Fire Pit and skating on The Wharf Ice Rink. Since opening its first phase on October 12 of this year, the mixed-use, waterfront neighborhood has hosted various free outdoor concerts and seasonal events such as Pumpkin Palooza and Thanks for Giving. The winter events will begin with the lighting of The Wharf’s 45-foot tall Christmas Tree on District Pier on Friday, Dec. 1 followed by the largest of the five seasonal events, The 26th Annual District Holiday Boat Parade on Saturday, Dec. 2 from 4 p.m. to 10 p.m. A beloved holiday tradition and a magical night of illuminated boating, over 60 participating boats will float down the Potomac River with a firework show to close the parade. Landside activities include crafts, cookie decorating, live music and more. Visitors will also enjoy seasonal drinks and fare at The Wharf’s one-of-a-kind restaurants as well as be able to shop for great gifts at The Wharf’s only-in-DC shops, and experience the holidays on the waterfront. The Wharf will also host a First Night of Hanukkah Celebration, Nog Fest and Christmas Caroling. The free events will stretch along the waterfront Wharf Street as well as the piers and will include music, festive decor, s’more making, crafts, seasonal beverages, guaranteed snow fall and festive fun such as photos with Santa Claus. 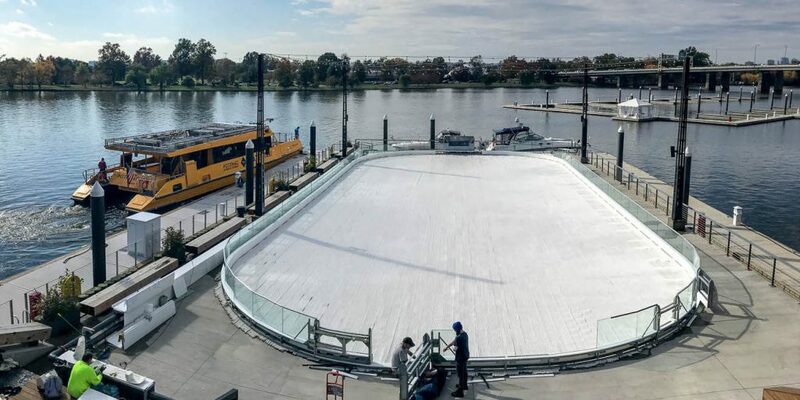 In addition to the five holiday-themed events, The Wharf is opening DC’s first ice skating rink on a pier. The Wharf Ice Rink will allow guests to feel as though they are skating on the water with amazing views along the Washington Channel. The new rink will be open every day from Saturday, Dec 2 to mid-February, weather permitting. The full list of winter events along with details on The Wharf Ice Rink are listed below. All events are FREE and open to the public and held at The Wharf, 700 Water Street SW.
Light Up The Wharf: The official lighting of The Wharf Christmas Tree. Visitors will enjoy hot chocolate, s’mores at The Wharf fire pit, holiday crafts stations, and live music for a bright and merry experience along the waterfront. The District’s Holiday Boat Parade: In its 26th year, this is The Wharf’s largest holiday event and a beloved holiday tradition of illuminated boating on the Potomac River, from Hains Point to the new docks of The Wharf. The boat parade will kick off at 7 p.m. led by the DC Fireboat John Glenn and concludes with a stunning fireworks finale at 8 p.m. 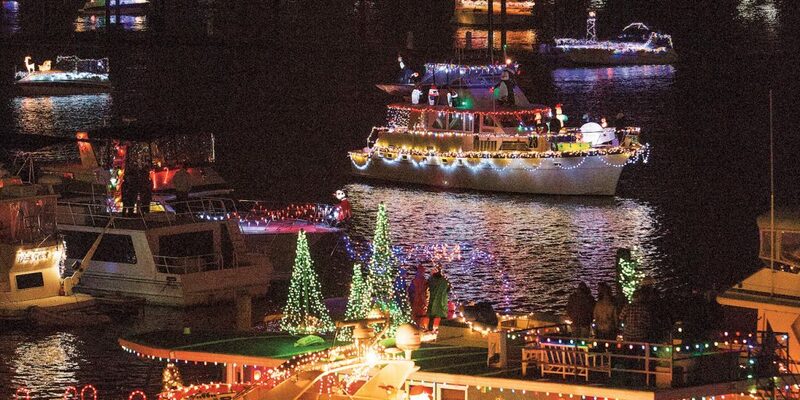 The festive holiday boat parade will include up to 60 beautifully decorated boats. Landside, the evening will feature a concert by Go Go Gadjet, holiday crafts, photos with Santa, and FIREWORKS! Visitors will be able to get into the spirit by decorating their own boat, sipping hot cocoa, making s’mores at The Wharf fire pit and the guaranteed first snow of the season. They can also visit The Wharf’s lighted Christmas Tree and enjoy other fun activities like ice skating on Transit Pier and sampling winter drinks at the Winter Waterfront Wine & Beer Garden. Parade begins at 7 p.m.; Landside festivities from 4 p.m. to 10 p.m.
7:00 p.m: The District’s Holiday Boat Parade Commences (with emcee Aaron Gilchrist)! The Wharf Ice Rink is open every day from Saturday, December 2nd through late February, pending weather conditions. In addition to general admission, The Wharf Ice Rink will host skating lessons, skate events including Southwest Night where local residents will receive a $2 discount on Mondays with a valid ID showing a 20024 ZIP Code and Rock N Skate where The Wharf will host a live DJ on Friday nights from 8:00 p.m. to 10:00 p.m.
Monday & Tuesday: 12:00 p.m. -7:00 p.m.
First Night of Hanukkah Celebration: A luminous evening celebrating The First Night of Hanukkah at The Wharf. Visitors will watch the lighting of the menorah, and enjoy complimentary cookies, s’mores, and live music. Plus, kids can get creative at a special crafts station. Nog Fest: An afternoon to enjoy a mug of your favorite seasonal drink or sample other tasty winter beverages at The Wharf’s Winter Waterfront Beer & Wine Garden. The Wharf will have fun activities for all ages, along with games and prizes! Christmas Caroling and Pictures with Santa Claus: An evening to enjoy the sounds of the season, featuring the Gay Men’s Chorus of Washington. Visitors will also enjoy s’mores at the fire pit and visit The Wharf’s illuminated Christmas Tree.